Aspenhome Furniture Storage Panel Bed Lincoln Park ASI82-412STBED. Lincoln Park’s Panel Storage Bed in sheer mahogany finish features intriguing shimmering and ribbon effects, adding depth to its dark chocolate color. Its scale is ideal for apartments and smaller homes. 1 x Oueen Storage Panel Bed - Panel Headboard ASI82-412, Storage Footboard ASI82-403D, Rails ASI82-402. 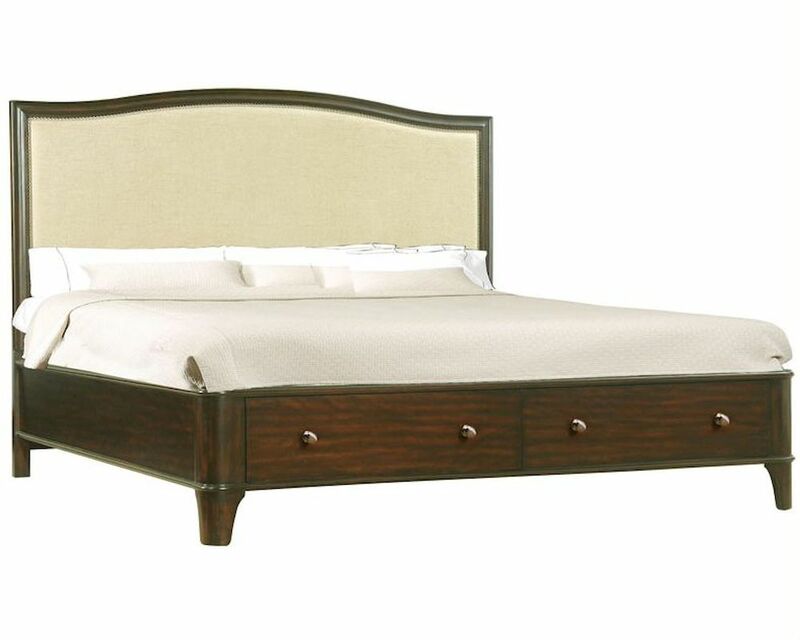 1 x King Storage Panel Bed - Panel Headboard ASI82-415, Storage Footboard ASI82-407D, Rails ASI82-406. 1 x California Storage Panel Bed - Panel Headboard ASI82-415, Storage Footboard ASI82-407D, Rails ASI82-410. Queen Bed– 65"W x 86"D x 60"H.
Queen Panel Headboard – 65"W x 4"D x 60"H.
King Bed– 81"W x 86"D x 60"H .
King Panel Headboard – 81"W x 4"D x 60"H.
California King Bed– 81"W x 90"D x 60"H .
California King Panel Headboard – 81"W x 4"D x 60"H.
Padded upholstered Panel Headboard with nail head trim.